Concentrated grapefruit tea filling machine suits for vicious liquid,like pure honey,molasses,Concentrated honey citron tea. Automatic servo honey filling machine has the following advantages:rapid wash,fast adjustment, volumetric pump action stepless,intelligent control with touch control. 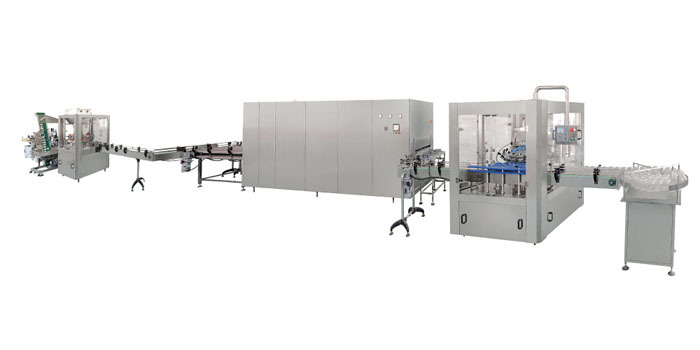 The honey filling line consists of honey filling machine ,washing machine,tunnel sterilizing,labeling machine and packing machine. 1. Controllable and various filling speed. 2. Integrated digital control with Siemens PLC and Hi-tech Touch Screen controls for easy operation. 3. Designed for easy change-over and cleaning. 4.Sturdy conveyer system driven by Panasonic motor. Adjustable conveyor guide rails to accommodate with different products. 5. Bottle holding mechanism for the best position of the bottles before filling action. 8. Warning light and buzz alarm to inform operator production error. 9. Filling zone protected by interlock guards for safety registration. 10. Memory slots for storing filling parameters for future operation. 11. Honey filling machine easy to install and operate, it only requires minimum maintenance for maximum performance and a long filler life time. 12. Delicate filler structure and finish comparable with European machines. 13. Volume set can be changed on the touch screen. Filling pistons are controlled by servo system. 14.Individual piston adjustment for fine tuning. 15. Digital control system to enable multiple filling actions on the same bottle for double, triple and more. 16. Concentrated grapefruit tea filling machine with fully automatic rise for nozzles, adjustment can be done on touch screen. 17. Nozzles can set to be above bottle mouth or bottom up, synchronizing with liquid level (beneath or above) to eliminate bubbling of foamy liquids. 18. Adjustable speed while filling, it can fill slowly at the beginning and then accelerate to faster speed, finally slow down once again to finish up. This can prevent foamy liquids from bubbling and avoid spillage.